The Professional Services industry is in its fourth straight year of steady growth and not slowing down. If you are looking to grow your business it’s crucial to evaluate your current systems and processes to ensure they are drivers and not road blocks. Are services and sales working together to build the right deals? Can you plan for future staffing needs? Do you have the visibility you need to keep projects on track? 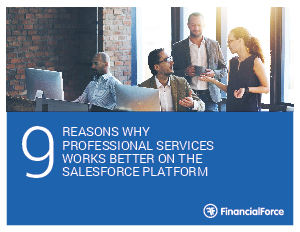 Continue reading and uncover the top 9 reasons why Professional Services works better on the Salesforce platform to help drive growth and bridge the services and sales divide for smarter services delivery.